Imagine you're outdoors at a busy airport with jetliners dotting its flight line. But something is different. The hiss of auxiliary power units (APUs) is gone. Instead, a whisper from the tail of the nearest jet tells you a fuel cell is providing clean, quiet, and efficient power for the airplane while it's on the ground. Boeing engineers are working to realize this tantalizing vision, which is just one of many fuel cell initiatives today being pursued across the company. Fuel cells are devices that convert the chemical energy of fuel and oxygen into electrical energy without combustion. They are extremely clean, highly efficient, and inherently reliable because the fuel cell stack itself has no moving parts. When fueled with pure hydrogen, fuel cells emit only pure water and warm air as exhaust. When hydrocarbon fuels are substituted, they have far lower emission levels than combustion engines. 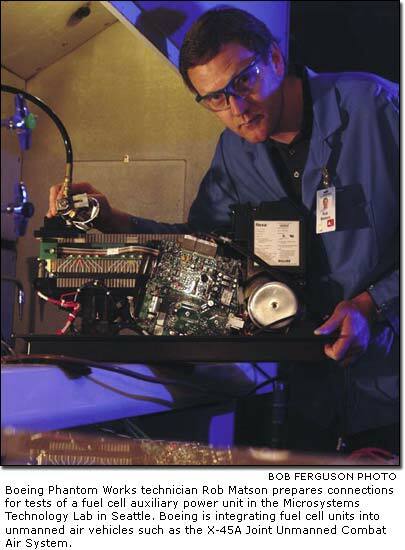 Although Boeing has used fuel cells in space, it has several current programs that are among the company's first applications of fuel cell technology in the world of aviation. They reflect the Boeing commitment to protect the environment by developing cleaner airplanes that will help ensure future generations inherit a healthy planet. Compared with the earliest jetliners, modern jets such as the Boeing 777 use about 70 percent less fuel and produce far fewer environmental emissions. While this achievement is noteworthy, Boeing cannot rest on its laurels. If commercial aviation is to continue to grow, this trend of ever more environmentally friendly airplanes must continue. 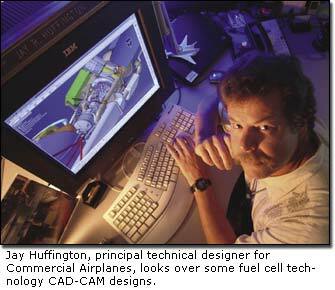 Fuel cell APUs are one way Boeing can meet this responsibility. The industry currently relies on gas turbine technology. Today each jetliner has a gas turbine APU-in effect, a little jet engine-that provides the airplane with electrical power and compressed air while it's on the ground. It can also provide backup power in flight if required. Although small compared to the main engines, the APU contributes about 20 percent of a 777-size airplane's airport oxides of nitrogen and sulfur emissions, because the APU typically runs for hours at the airport versus minutes for the main engines. On average, gas turbine APUs are 15 percent efficient at converting jet fuel into electricity. In contrast, fuel cell APUs will be 60 percent efficient, which will reduce by three quarters the amount of fuel an airplane uses to generate ground power. And because a fuel cell APU produces electricity electrochemically, not through combustion, its oxides of nitrogen and sulfur emissions will be negligible and its carbon dioxide emissions will be very low. The Boeing fuel cell APU concept envisions a hybrid system that combines a solid-oxide fuel cell with a compressor, turbine and other components. 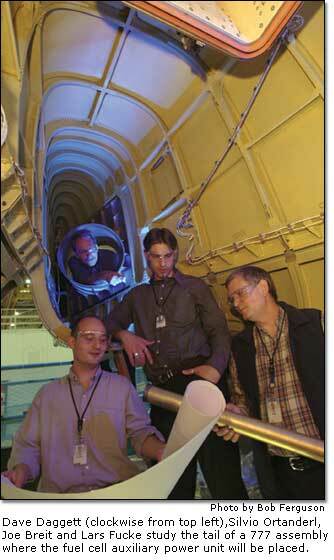 This turbo-machinery pressurizes the fuel cell stack to maintain efficiency during high-altitude cruise. Because fuel cell APUs are so efficient, they may well see regular in-flight use. In contrast, turbine APUs are not used in flight except when backup power is required. "It's very exciting to be working with 'disruptive technology,' which means moving to something entirely new versus improving what's already there," said Dave Daggett, technology leader for energy and emissions at Boeing Commercial Airplanes Product Development. "Even more exciting is that the fuel cell APU may someday play a major role in the air as well, because it dovetails perfectly with the Boeing more electric airplane [MEA] concept." The MEA concept-a significant change in how Boeing thinks about jetliner systems-is another way the company is working to meet its commitments to good corporate citizenship and protecting the environment as stated in Vision 2016. Using fuel cell power, MEA-and its ultimate expression, the all-electric airplane-will yield efficiency gains across a broad range of fronts. Under this concept, the airplane's cabin pressurization, environmental control system, lighting, cockpit instrumentation, wing anti-ice protection, and control-surface and landing gear actuation will someday all be electrically powered. In this airliner of the future, the fuel cell APU will also operate in flight as the full-time source of primary electrical power. Starter/generators fitted to the engines will provide engine starting and redundancy, but will not actually be called on to generate electricity in flight except to assist with high-load conditions such as landing gear actuation or initial powering of the galleys. This approach frees up the engines to devote all the power they generate to thrusting the airplane. Additional fuel is not burned to continuously generate electricity, and high-pressure air is not bled off the engines for cabin pressurization. This fuel cell technology application could achieve 75 percent efficiency in converting jet fuel into electrical power during cruise. The resultant fuel savings-particularly in long-range flight operations-create what engineers call a virtuous circle in design, in which the benefits compound each other to allow a fundamentally lighter and more efficient airplane. The first stage of MEA thinking is evident in the ultra-efficient 7E7, which will feature electrically powered cabin pressurization. Unfortunately, fuel cells won't be ready in time for this all-new airplane's planned service debut in 2008, although the 7E7 will likely be easily upgradable once fuel cell APUs become available. Today industry, government, and academia are collaborating broadly to realize the potential of fuel cells. Boeing is working with fuel cell and other manufacturers, industry associations, U.S. government agencies such as NASA and the Department of Energy, and other parties to further this effort and ensure that all parties take into account the requirements of aviation. The specific power density (i.e., power output relative to weight) of fuel cells has increased tenfold in the last decade. Despite this progress, a further fourfold improvement in power density will be required before the fuel cell APU concept becomes a reality. The Boeing team hopes to have a working fuel cell APU prototype in 2010, which would allow commercially manufactured units to enter operational service in 2015. "I feel very certain it's going to happen; I'm just not sure when it will happen," Daggett admitted with a smile. "Meeting our projected time frame will require continued investment by industry and government. I'm impressed by Boeing's willingness to invest and proud that we're leading the industry in adapting fuel cells to commercial aviation."